Of course, I’m building up my tolerance for alcohol, slowly but surely. So far, I’ve figured out (from friends that “know wine”) that though I like the texture of “smooth” wines like reds and whites, I prefer the sweetness of rosé wines enough to put up with how dry they are. Mind you, the only reason I know the difference between a smooth one and a dry one is because Rouge said my wine was dry and Sandra’s wine (a red) was smooth. I figure the fact that Sandra’s wine seemed a bit… heavier and thicker than mine, and that kind of bite that mine had all the way through it (as opposed to the obvious bite of the alcohol at the end) would be the smooth vs. dry thing… anyway, I’m limiting myself to a single glass of wine at a time, and I will always eat something with my wine. If I don’t have anything to eat, and I can’t get anything to eat, I won’t be drinking. This picture was taken at Au Bureau in Place Plumereau Tours. Place Plumereau is a square with a lot of different magazins et restaurants. We (the Sweet Briar kids and our mentors) went there after our meeting and picture. More on that in a little while. As I stated in my last blog post, my Friday started out with going to l’Institut de Touraine with my host sister Anna. She lent me her ID card that had her WiFi login information on it so I could check my email and blog, among other things. After I did all that upkeep, I walked back up to Rue Nationale (which is under some serious construction to the point that no cars are being allowed through, which is actually kind of nice), and I visited one of the at least three (that I can remember seeing) Orange stores. Orange is a cellular service provider in France. From what I can gather, it seems to be the one that offers the best service (meaning least dead zones). I was hoping that my phone really was unlocked, and I could buy a SIM card but no, it wasn’t, so I couldn’t buy the card. I’m going to have to buy Sandra’s extra phone, which is still definitely a good thing, because she’s giving it to me for a fraction of what it’s being sold for in the stores. After that, I went to that health food store on Rue Grandière and checked out their sans gluten section. I then learned I’ve been pronouncing sans gluten wrong all this time. I say it “glootan” and everyone here says it “glooten.” Either way, I say it right now. They happened to be having un dégustation today, so I got to try some biscuits with caramel “shards”, some cookies, and some madelenes that were stuffed with apricots. I always thought that a cookie was un biscuit in French, but I realized there was a difference today. Un biscuit is still a cookie, but it’s more cracker-like and it isn’t as sweet as un cookie. I bought all three (since all of them were discounted), some snack packs of crackers (hoping I could find a fromagerie to get some cheese for a cheap lunch), and a small packet of bread so that Madame would have an easier time making me a sandwich for tomorrow’s excursion (she was going to try to make one with the rice cakes until I told her the idea was nice, but it probably wouldn’t work out too well). Much to my surprise and delight, ALL OF THAT WAS UNDER 17 EURO. I can’t buy that much yummy gluten-free food in America for that much, really. Those madelenes were seriously to die for. They had normal ones as well, assuming you missed having them with your tea (which is also good), but I loved the apricot ones. As hard as I tried, I couldn’t find a fromagerie on Rue Nationale to save myself. I did, however, find a Subway right when I was too tired and too thirsty to continue walking (when I was about halfway back to my host mom’s house without ever intending to go there). I felt like such a traitor for eating there, but it was cheap and easy. 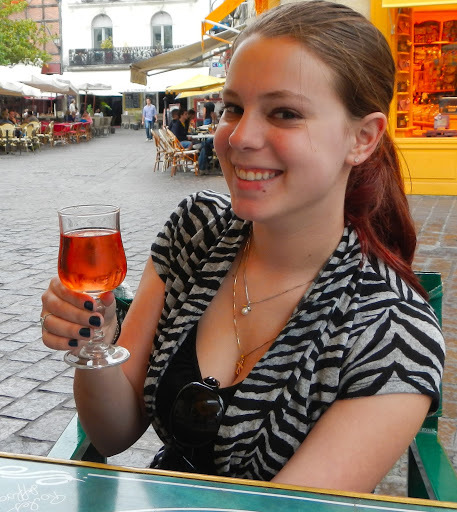 Besides, I have plenty of time to get real French food, and I’d like to wait until I have a JOB to do that. Looking at some of the posted menus for the restaurants and cafés I passed was a nightmare. Some wanted 12 euro for a simple salad. Really? I got a simple salad, chips, and a drink for under seven euro at Subway. Bite me. I headed back to l’Institute after that for some more WiFi-ing before the Sweet Briar meeting, where I got my own ID card to use for WiFi, signed a pledge that said I wasn’t going to drink excessively (duh) or do illicit drugs (double duh), and that I would only speak French in class, in the offices of Sweet Briar, to the officials of Sweet Briar, etcetera. I think that pledge (the language part) is pretty cool. After all, no one really came to France to better his or her English skills, now did they? I signed up for a wine tasting on Tuesday with Sheila, Sandra, and Rouge, and we’ve been told that there are five levels of French (named after five of the châteaux of the region) that we could have tested into with the placement tests we all took online over the summer, and there will be a list of who got into what classes up on a door first thing Monday morning before the classes start. After the meeting was over, we took a big group picture, and I ended up right in the front row! Considering I was covered up by some big huge jock for my senior class panorama that was taken in high school, this was pretty cool for me. After that, we all headed over to Au Bureau… right as it started raining. Thankfully, I had my trusty parapluie. We were given drink tickets that would get you two free drinks, and you could get whatever you wanted. Smart people got a glass of wine and a glass of juice, and maybe un carafe d’eau (which an establishment has to provide for free by law). Some got two glasses of wine. Some didn’t get any wine at all… Rouge had a glass of white wine, Sheila and Sandra had red. I came out with my rosé and they all wanted to try it. We all passed around our glasses. I definitely liked the texture of the white and red wines that they had, but they weren’t sweet enough for me. Since I’m new to the whole drinking thing, I need what I’m drinking to be sweet to get past the bitterness of the alcohol, even if it’s really dry. If I can’t have rosé, I’ll get a white wine. Sheila and Sandra went back to cash in the second portion of their drink tickets later for white wine. Rouge and I ended up losing our second drink tickets, but no matter (it was windy). Rouge finished her glass last (even after the second round for Sheila and Sandra), and had I wanted a second drink, it would have been water, juice, or maybe even milk if it was available. I had saved my potato chips from Subway, so I ate those with my wine. I frowned, and continued. In French. That was the end of the conversation. I thanked him immensely, left, and made it up that terrible hill. Despite the fact that my college is literally built on a hill, I’m out of practice (and out of shape). I’ll definitely be IN practice when I get back, however. Anna went out with a friend to some bars last night, and since Madame has her “I want you to call me if you have to come home alone so I can come get you” policy, she actually stays up until you get home. I usually wake up in the middle of the night to go to the bathroom, and that was at about two in the morning last night. Madame was still awake on her computer, I guess Anna wasn’t home yet. I’m not a night owl as it is, but since Madame doesn’t give us keys (though we don’t need them), and this is how she likes to work things, I would definitely feel bad for being out later than midnight, certainly not one or two. I believe Anna was out until five. Either way… I didn’t sleep all that well last night. I was in a lot of pain from all the walking I’d done (méchant colline), and my back was starting to hurt again since I had starting sleeping in a modified manner at home (with a pillow under my hips) and I’m not sleeping that way now (since I only have one pillow and my head gets dibs). I ended up getting up about 15 minutes before my alarm was set to go off. I got ready at a leisurely pace, and right when I was set to eat petit déjuner at eight, Madame knocked on my door (I think she thought I’d missed my alarm because I do all of my getting ready in my room and I hadn’t left it yet), so I came out, all ready to go, ate my breakfast (one and a half galettes du riz avec confiture et beurre, et du thé avec du miel), and headed out the door with what I THOUGHT was plenty of time. I thought it took me and Anna about half an hour to get to l’Institut yesterday, and I’d only have to go about half the distance to get to where the buses were for the excursion today. I left with about half an hour to get to my destination, and ended up making it there five minutes before I thought the buses would be leaving (for the record, they left half an hour later), 25 minutes after leaving the house. This definitely worries me, I guess it’s going to take me 45 minutes to walk to l’Institut on Monday! I’m thinking that’s because my legs hurt so much… Once they get used to all the walking, I should feel better… and walk faster… hopefully. 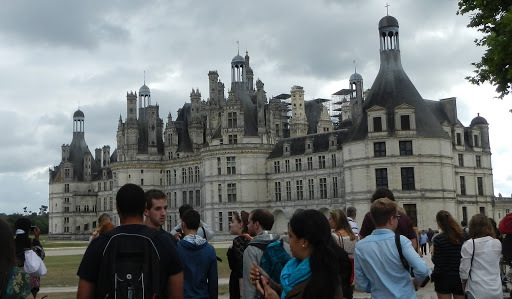 First stop was Le Château de Chambord. It’s big and pretty… and the double staircase is pretty cool. The idea is that two people can get on the staircase, one can go up, the other can go down (or both can go the same direction because you get on from different sides), and you never see each other. Frankly, it’s too big to take in at once, in my honest opinion. The quote of the day goes to Rouge, “You know, I’d watch The Tudors, and I never really understood how they could get away with so much adultery. Then I come here, and see a place this big… and now I get it. You could go weeks without seeing someone if you really wanted to.” After we walked through quite a few rooms, we went out to some tables and chairs and sat down for our picnic (our host families had made us lunches that we’d brought with us). I was two bites into my sandwich au jambon (sans-gluten, mais oui), and it started to rain! We were sitting by one of those covering things, so Rouge and Sandra tried to get it to work, and Sheila pulled out her umbrella to cover herself, and I couldn’t decide whether I wanted to eat, or to try to help with the covering, or to get my umbrella… so I started to pack up my sandwich, and after a minute of Rouge and Sandra struggling with the covering (and with other people pointing and laughing at us), we threw what bits and pieces of our lunches we’d taken out to eat back into our bags and ran back into the château. We waited for the rain to let up, then went back out to the tables and ate some more. Madame made me two sandwiches with the bread I’d bought yesterday, the other sandwich was prosciutto and butter. 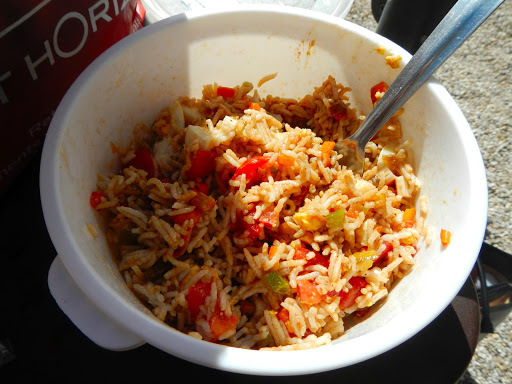 She also made me a rice salad of some sort with peppers and all sorts of stuff in it. I think there was crab in there somewhere as well! It was so good, I passed it around to my friends to have them try it, and I shared it with them since they all loved it. After a while, we went back to the buses to head to our destination. 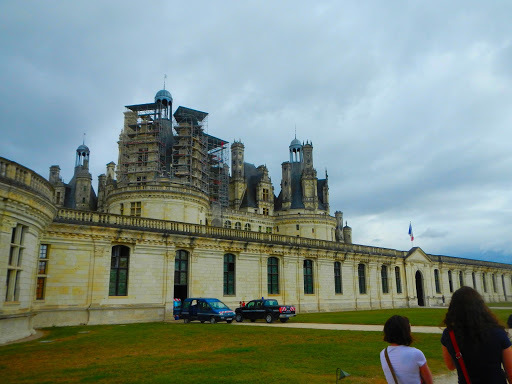 Here are some of the pictures I took at Chambord. That’s the rice salad I shared with all of my friends! Yum! 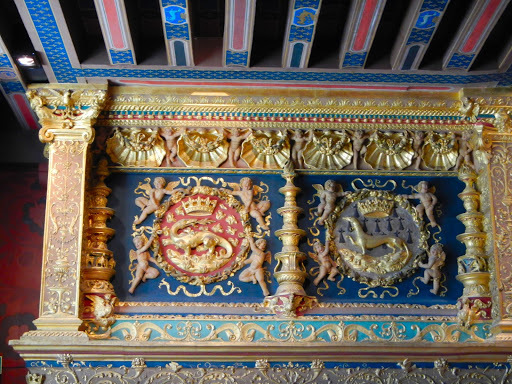 Next was Le Château de Blois (or Le Château Royal Blois). I have no idea why this occurred to me here, but I realized my camera had a panorama mode, so I started using it. 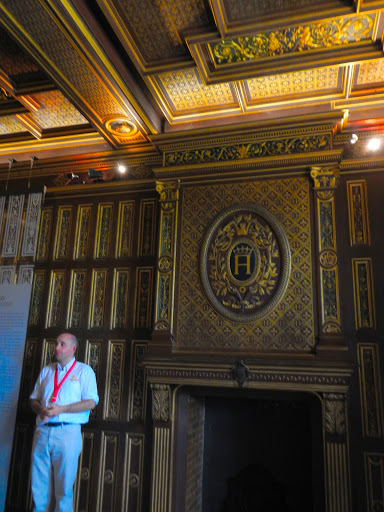 I managed to make three really great panoramas at Le Château de Blois, so hopefully you’ll be able to see them in enough detail here. This Château topped Chambord for me. We had a guided tour, and even though our guide spoke English (there was a British flag on his name tag), our tour was in French, which was pretty cool. 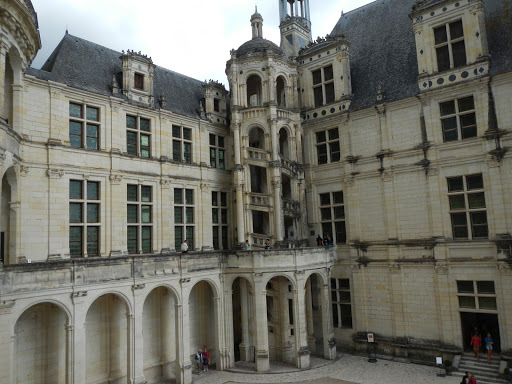 I thought Blois was much prettier than Chambord, and I loved the fact that in the courtyard, you could tell that there were four distinctively different styles of architecture going on that different monarchs decided they liked. 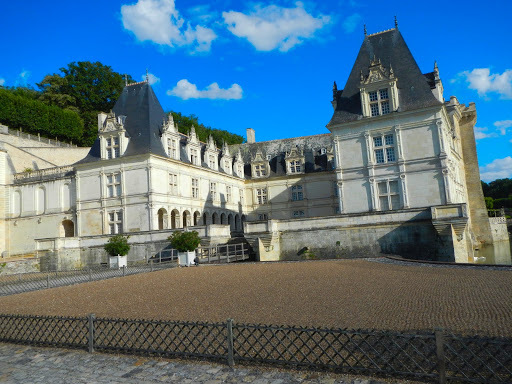 Le château du Moyen Âge during the 18th century was all Gothic, then came Louis XII and his Flamboyant style (this part of the courtyard is in all brick and rock), next is François the first with the Renaissance style, and finally Gaston d’Orléans with the Classic style. 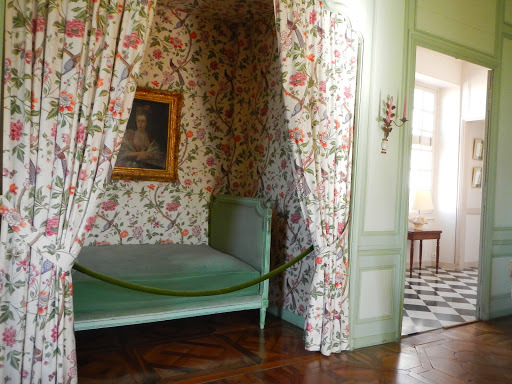 The interiors of the Château were more colorful as well, which I definitely appreciate. 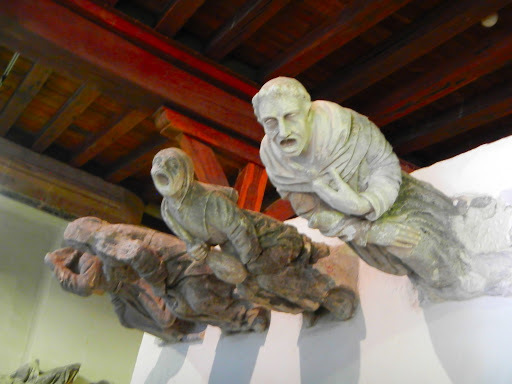 Maybe I was a little more partial to the guided tour as well. Who knows? After the tour, my little group took a look at the Boutique, but everything was really over-priced. 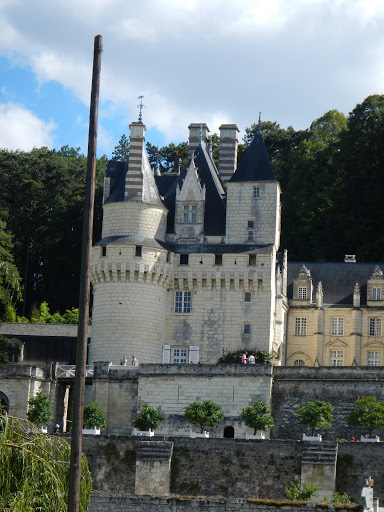 We had a while before we needed to go back to the bus, and we’d passed by some other shops between the bus and the Château when we originally came, so we thought we could find some cheaper things (or the same things at a better price) at another shop. We did! I bought some postcards to send to people back home, and a keychain (since they’re easy to bring back as gifts). When we went back to the bus, Sandra had brought the phone she’d promised me, and I paid her for it. 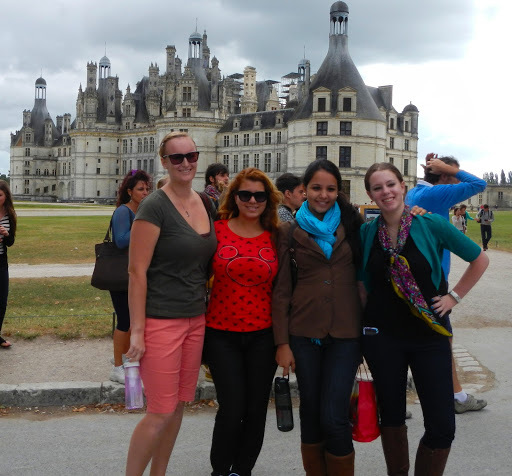 Here are some pictures from Blois. 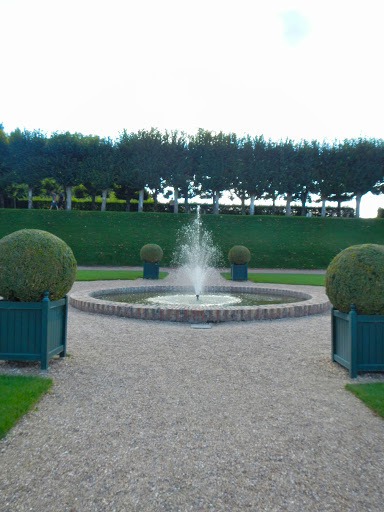 Panorama of the outside of the château. 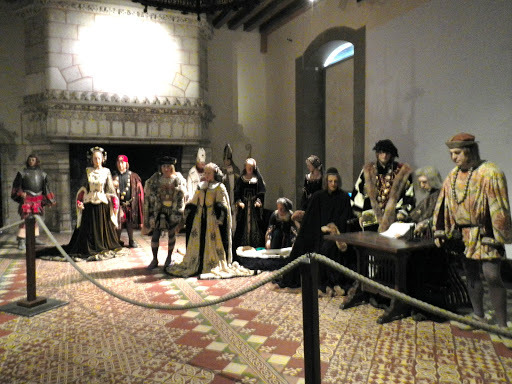 Panorama of 3/4 of the inside of the château. Styles from left to right: Flamboyant, Classic, Renaissance. Inside the Queen’s Studiolo, and the guy in the picture was our Guide. Once we got back to Tours, all the construction in the area forced me to walk past an Orange store on my way home, and it happened to be open. I figured I’d try to buy a SIM card for the phone I’d just bought from Sandra. I’d been told it was a Samsung Galaxy S3, which is similar to my Samsung Galaxy S2 Skyrocket. The salesperson at Orange told me that I actually had a (I kid you not) Sansumg Galxay S3. Worse; the logo on the phone actually says SUVNSMG. Apparently, the phone I have is a knock off! Sandra’s dad had bought the phone in China. No big deal, honestly. It works. It has a few, ahem, interesting apps already installed, and it doesn’t have the Google Play store that I like using (so I can’t get my usual Tweetcaster app), but it does already have the important apps installed, like Twitter, Skype, and Facebook, so it’s still a working smartphone. It only has five euro worth of credits on it, and because it’s a smartphone, it requires internet access to work, so it’s more expensive to use. I don’t want to officially switch to it until I add some more credits to it just yet, so I’m changing some settings and figuring out where everything is on it so far. Back to Madame’s, and I didn’t get lost today (I figure I only need to do that once)! Anna was going to have a friend over for dinner, so Madame told me to rest for a bit before that happened. While I was resting, charging my knock off, and working on some other things, a friend of Madame’s stopped by, and she called me out of my room. The friend had a gift for me! Gluten-free cookies from Carrefour! Carrefour is a supermarket type chain in the area similar to a mini-version of a Save Mart, I’d say. I didn’t realize they had anything gluten-free, but I guess they do! This was the friend that is gluten-free like I am, but for her fibromyalgia! We talked for a few minutes, so that was nice. After that, back to my room for a while to draft this, and Anna and… CLAIRE came home! Anna’s friend (also from Japan) is also named Claire, which I find pretty hilarious. When I visited Japan a while ago, my host family (I was only with them for a few days) couldn’t pronounce my name, so the fact that Anna’s friend is actually named Claire (not like she picked it as an “English/French” name) and she’s Japanese is really amusing to me. Yet another four course meal for dinner! Madame never ceases to amaze me! Entrée involved some previously cooked, then cooled dishes; one was a tomato dish, the other was a stuffed eggplant. Plat principal was a rice pilaf with a white fish and a cream sauce (to DIE for) that Anna had specifically asked Madame to prepare. The cheese offering was the same as last night, and dessert was an almond cake. According to Madame, it’s only three ingredients: eggs, sugar, and almonds! It was very tasty, and of course, sans-gluten! I have no idea what I’m up to tomorrow. It’s a free day according to Sweet Briar. I’ll just have to see what Madame has in store! I do know that she’ll take me to a supermarket to buy a notebook for class on Monday, however! Maybe I really am a little bit jet lagged… I woke up at about 7:30 when my alarm was set to go off an hour later. When I turned on my US phone, my mom had texted me about ten minutes earlier, so I stayed in bed to rest my back and texted her for a while. At about eight, I got out of bed and started getting dressed and ready for my day. I’m beginning to realize that I’m much more comfortable having an hour to get ready before breakfast instead of the 30 minutes I’ve been “allotting” with my alarm setting, though I’ve yet to actually hear my alarm go off since I’ve been getting up before it’s set to go off. I’ll make sure I set it for an hour before I’m supposed to have breakfast tomorrow, just in case. After I’d gotten dressed and set out my make up, Mom and I talked on the phone for a little bit once I was sure Madame was up and in the kitchen (the walls are thin, and I’m definitely sure the “loud American” stereotype is true now). She put the phone to Noah’s ear so he could hear my voice (she’s told me in text that he’s gone looking for me to put him to bed at night) and I teared up a little bit. She told me he perked up when he heard me. He’s doing “okay” being with his grandma, since he knows her, but since he’s been mainly with me and only me for over a year, this is a confusing time for him (AND FOR ME). We only talked for a few minutes since it’s expensive. My strategy with this international plan (for the last few days I plan on actually having it) is to do most of the conversation via text message (which is still “free” since Mom upped my messaging plan), then call the other person for a quick “goodbye/goodnight and I love you” to hear the other person’s voice. I did that with my boyfriend last night. I went out to the dining area for breakfast at nine, which Madame and I had talked about last night. I think she finds it amusing that I like setting a time for breakfast on a weekend when I don’t have anything planned, but I like having a schedule. The conversation last night was kind of like “What time is breakfast tomorrow?” “Whenever you’d like it, I have no idea.” “That’s why I wanted to ask you!” then we decided on nine so we both could sleep in a little while. Madame had set out the usual black tea, galettes du riz, and a whole bunch of gluten-free cookies, including the biscuits avec éclats du caramèl I bought at the health food store on Friday, and the sablés avec framboise (shortbread cookies with raspberries) that Madame’s friend had brought over yesterday. I had half of une galette with confiture. I’ve stopped putting du beurre on the galette. The jam just rolls right off of it if I have butter too… I figured I’d try des biscuits. Since they’re cracker like, they’d go well with my tea. I tried a piece of one on it’s own, very tasty, then dipped it in my tea like English people do. Even better! The biscuits come in packets, four packets to a box, five biscuits to a packet, so I ate an entire packet. A breakfast of that half galette, un paquet de biscuits, et deux tasses du thé was more than enough for me. I’m surprised I’m doing so well without the usual American breakfast of protein, but I’m happy. Anna came out after a while and had breakfast with me. After that, Madame came out, showed us les nouvelles (the newspaper) and what there was to do, told me we could go to the supermarket to get my notebook, and some other suggestions that I didn’t catch, but didn’t argue with her (I actually said ça m’est égal which means “I don’t care one way or the other” which I understand is neutral, and Madame smiled and laughed, so I hope I wasn’t rude). I suggested she tell her gluten-free friend about the biscuits I’d tried so she could try them too, as a way to thank her for bringing me the shortbread cookies. I went back into my room and wrote up the four post cards I’d bought yesterday. I’m sure the post offices are closed today. If they’re closed on Sundays in America, then they DEFINITELY are in France. I plan on sending them soon. Needless to say, I have writer’s cramp now! I like getting postcards from friends when they’re abroad, so I put out a call on Twitter and Facebook that if anyone wanted a post card while I’m here, they should send me their address and I’ll try to get them one. This set of cards are going to family. I’ll warn any friends reading this now, family gets first dibs! Off to the supermarket we went. It took me a while to pick out what cahiers I wanted for class. There was a huge selection! The paper in France is a little odd, there’s more than just lines… I was telling Madame I couldn’t find paper without petite boîtes and that’s the kind of paper I wanted. At first she couldn’t understand, and then she started laughing. She said she’d never heard that before. The little boxes that were on the paper are called… something else. She pointed to a nearby packaged box and said that was une boîte. We laughed, and continued on. Hey, French isn’t my first language. I’m allowed to make mistakes. I ended up buying a pack of three cahiers with something that’s not petite boîtes that I have to learn to live with. I’m just going to try to ignore them. All French notebooks have paper like this, it’s not like American notebooks with just lines. I also bought some toiletries in a normal size to upgrade from my travel sized ones. When we got into the car, I went to tweet that I’d survived my first supermarket adventure, and I noticed a text from my Mom. “Your dog refused to go into his crate until I put it beside your bed, as he requested.” I reacted, and I was sitting in the front seat, so Madame saw my face and asked what was wrong. I replied to my Mom quickly, and had to try to explain. Here we go with boîte being the wrong word for something again… I warned her and said that I knew boîte was the wrong word to use, but it was the only one I knew to use at the time. I’d been searching for the wrong word in my dictionary the entire time. When I reverse-searched for niche later on, it came up as “kennel.” In America, we don’t say that we “kennel train” a dog, we “crate train” them. Madame went on to explain that une caisse is usually used like something you’d pack for transport. In context, kennel would have been the right word to use. I got to have lunch with Madame alone. Anna went out with some friends, and Madame had packed her a lunch. Even lunch was four courses! We had a tomato and lettuce salad with a type of balsamic vinaigrette for entrée, then veal (that she quick seared after the first course) and zucchini (courgette) for plat principal, cheese as usual, and a few different types of fruit for dessert. Let’s see if I get this right… I tried a maribelle (someone correct me if I spelled it wrong) which was a little yellow fruit that looked just like a little yellow cherry tomato. Madame explained that it was in the plum family. It had a pit, but it’s the kind of fruit that you pop in your mouth, eat around the pit, and remove the pit after the fact. It tasted like a pluot (cross between an apricot and a plum)! Remember, I’m a Californian, so I get to eat fruit-crosses regularly. I told Madame about the pluot, and she understood, though she’d never heard of it before. After that, Madame asked me if I wanted du café, though she knew that I didn’t like having coffee for breakfast. She said she asked anyway because après déjuner coffee is a different kind of coffee than breakfast coffee. I hesitated and said I’d try it. Pourquoi pas? Being an American, I thought I was getting a mug of coffee. When Madame returned with two demitasses, I got a little scared. C’est espresso? Oui! She told me if I didn’t like it, she’d drink it for me. I had told her that I’d only drink coffee if I really needed the caffeine, and then I’d go to Starbucks and order a mocha, not just a cup of normal coffee. She said she understood. She then asked if I’d like sugar with the coffee, so I had some figuring it’d make it taste better. I tasted it after putting the sugar in, and much to my surprise and relief, I liked it! I told Madame about my previous experiences with espresso and Starbucks, about how I’d try to drive between my college in Los Angeles and my home which was a six hour drive, get sleepy as soon as I got behind the wheel, and require a Starbucks stop at least once. I’d get a shot of espresso, hold my nose, and swallow it in one shot because it was so bitter and strong. This got Madame to talk about how she watched an American movie (she never did tell me the title) once, and every shot seemed to have a character with a mug of coffee in his or her hand. I told her about how there’s definitely a coffee/caffeine addiction in America. Madame and I got to talk about a lot of things at lunch, like her husband and how formidable he was, how “weak” Americans can be when they get sick, some of my health problems, American work ethic, my mom’s garden at home, how I don’t like to be corrected but I know I have to be, things like that. It was really nice. 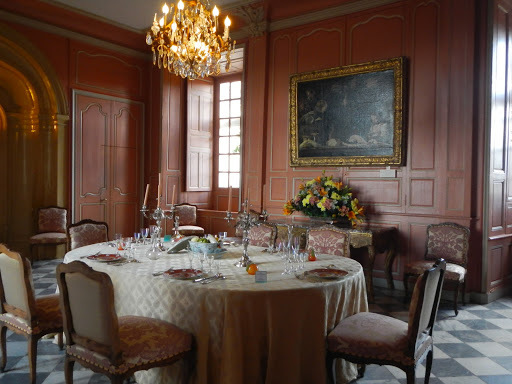 After lunch, we set out on our mission for the day: Visit as many of the Châteaux around Tours that Sweet Briar wasn’t going to take me to as possible! 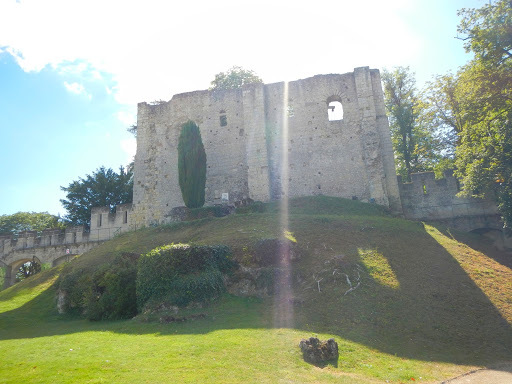 Our first stop was Le Château de Langeais. 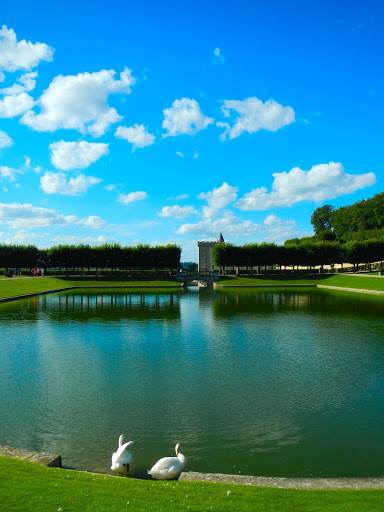 Madame told me on our way there that it’s a relatively small château, but she wanted to take me there because the garden is very pretty. She parked the car, and told me that because there were a lot of stairs, she wanted to stay in the car, but would go along with me if I really wanted her to. I told her I understood, asked where the entrance was, and went on my way. I asked if she wanted me back at a specific time, and she told me to take my time. Getting into Langeais isn’t very expensive. For someone between the ages of 18 and 25, it’s only 7,20 euro! 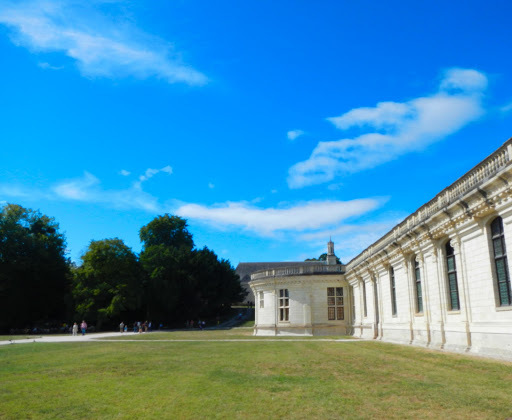 In the essence of getting to as many Châteaux as we could, I took the guides brochures with me, went through the rooms, took my pictures, and left. I spent a bit more time in the garden, which was awesome as Madame had said. I took about 30 pictures. 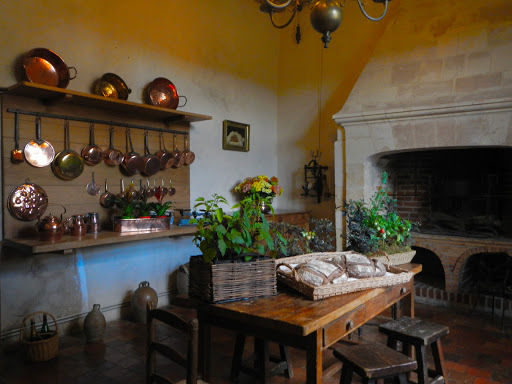 Here are my favorites from Langeais. Next stop was quick. 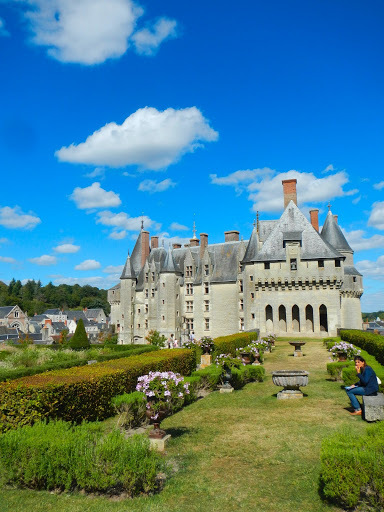 We visited Le Château de Ussé, and on the way there, on a VERY windy road, Madame asked me if I knew the conte du fée about the princess who lived in a château who was cursed by a fairy to sleep for 100 years. It didn’t ring a bell right away, so she started telling it to me. As soon as she said that a whole bunch of fairies were invited to the celebration of her birth, but an evil one was left out, and the evil one put a curse on the baby princess that said she’d sleep forever if she was pricked by a cursed spinning wheel, I knew what it was. Madame likes to finish her stories, so I let her continue, but you know the rest, right? 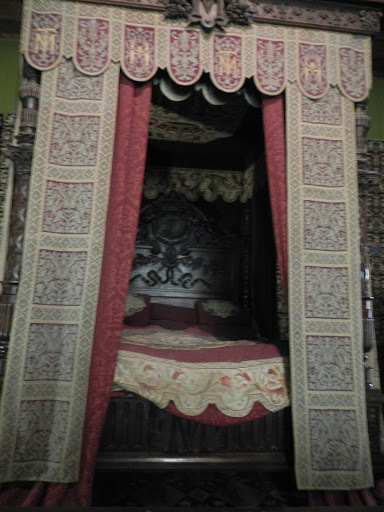 I told Madame that I knew the story, Disney made it into a movie called Sleeping Beauty, but I didn’t realize it was a French fairy tale, nor did I know that it supposedly took place in Le Château de Ussé! 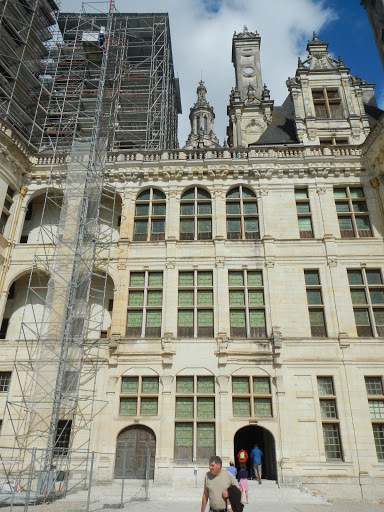 At any rate, the Château was closed for construction, but Madame drove me to it anyway so I could snap a few pictures of the front of it. As far as I’m concerned, that’s a visit! Here’s the best picture I took. Off to the final château for the day: Le Château de Villandry! 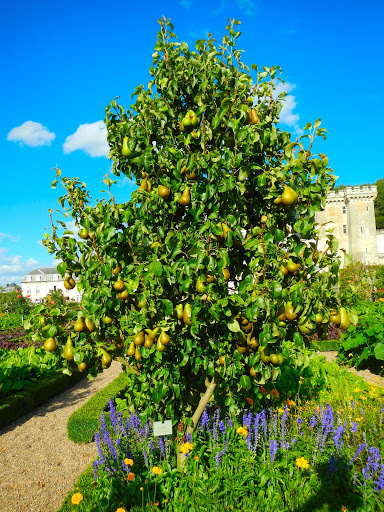 Madame said that since I liked the garden at Langeais so much, I’d LOVE Villandry. She parked again, said she’d wait for me, and told me I could take as long as I’d like. I was getting tired, so I didn’t want to take too long. 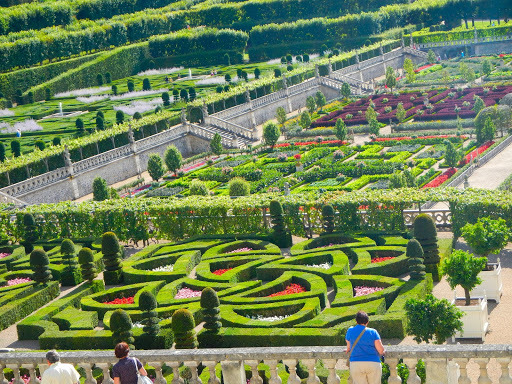 I checked out the ticket prices, and you have the option of getting a ticket for just the gardens, or the château AND the gardens. I wasn’t exactly pleased, a ticket for the château and the gardens was 9,50 euro (but once I got inside, I stopped internally complaining). I went up to buy my ticket, and the lady selling the tickets asked my for my nationality after asking what kind of ticket I wanted. I answered “États Unis” (and in retrospect, it would have been more appropriate to say “je suis américaine” but I asked Madame about this later, and she said either works). I thought the question was somehow needed for my ticket. Nope. She was just curious, then she told me I speak French really well, so that kind of made my day. I went out and picked up two guides, one in French to use, and one in English to take home. I went “upstairs” to get a better look at the garden and was pretty taken aback when I got my first look at it. 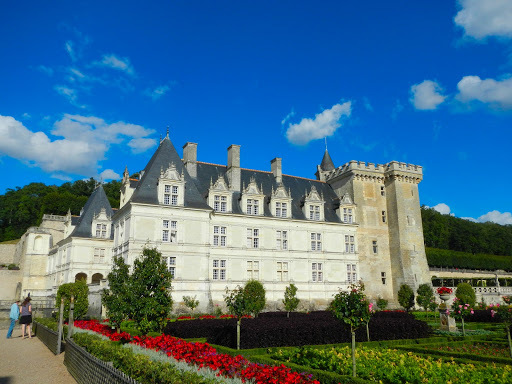 After gawking for a bit (and taking some pictures, mais oui), I went inside the château, took more pictures, and headed back out to the gardens. The guide had a map and a suggested route to give you the most comprehensive look at the gardens possible, so I followed it. No joke, I was near tears the entire time I was walking through, the gardens are that beautiful. 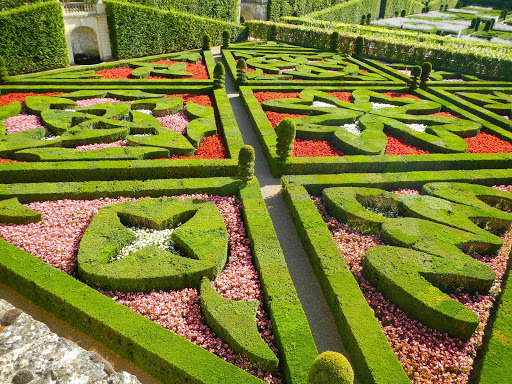 Anyone who has a bucket list, stop what you’re doing and put “Visit the gardens at Le Château de Villandry” on it right now. Trust me. I’m no photographer, I’ve never taken a photography class in my life, but if my photos that follow this paragraph make you say a SINGLE “oh wow” imagine how you’ll feel walking through the garden yourself! 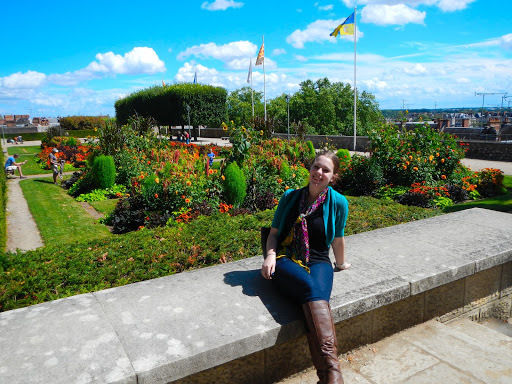 There’s a sun garden, a labyrinth, an herb garden, and a vegetable garden, among other things. I bought a few more cartes postale to send back to America after I was done in the gardens. I went back and looked through my pictures and Madame was stunned when I told her that I’d taken 80 photos! I promise, the ones that are here are the best of the best, and it was really hard for me to choose my favorites. You’ll be able to see all of the photos on my Flickr account (that’s what the slideshow’s from) once I upload them. Back to the house, and while Madame made dinner, I uploaded and organized my pictures. We had a cold tomato potage (thin/blended soup) for the entrée with diced concombre, then Madame got creative for the plat principal. She took the leftover fish, rice, and cream sauce from last night, mixed it together, put it in a casserole with hard boiled eggs and cheese on top, then broiled it. It was delicious! Cheese after that, then for dessert, we had the leftover almond cake, reinvented with a little rhubarb compote. This was pretty cool for me, strawberry rhubarb pie is a favorite in my family, though when I told Madame about it, she said that a combination like that isn’t very popular in France. I don’t have that pie often at home (only because there are four or five different pies to choose from, and I like the other pies offered more), but that compote on top of the almond cake was quite nice. 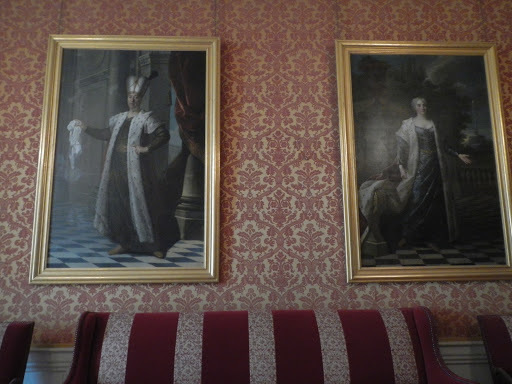 After that, I showed Madame and Anna my pictures from today’s châteaux, and I ended up showing them a few of Noah. 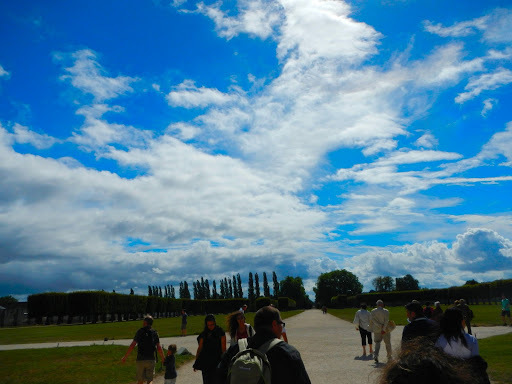 I had to explain why I had taken a few pictures of people with dogs at the châteaux. America is surprisingly not dog-friendly. In the town where my college is, you’re not allowed to have your dog anywhere near the parks, not even on a leash, and there aren’t any dog parks. 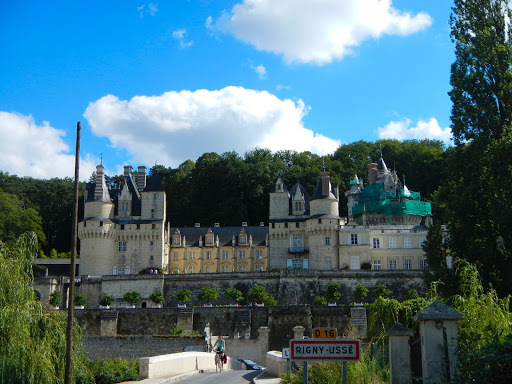 You can take your dogs just about everywhere in France, including the châteaux. You couldn’t really take them inside the buildings, but the fact that you could have them in the gardens really astonished me! That was one reason for the pictures (I wanted to show them to my mom), the other was because there was a King Charles at Villandry, and Noah is the same breed. Madame guessed Noah’s breed right away, and said he was very cute. She loves King Charles Spaniels. I told her and Anna about Noah being a therapy dog, which they thought was very cool and praised me for. 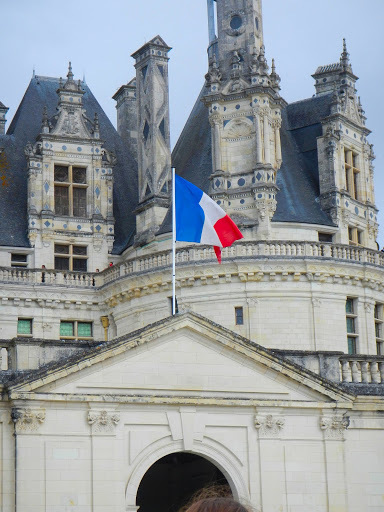 This entry was posted in Blois, Chambord, Disneyland, fairytale, food, France, french, gluten, knock off, Langeais, petite déjuner, scenery, Touraine, Tours, Ussé, wine. Bookmark the permalink.